Today’s card is special. 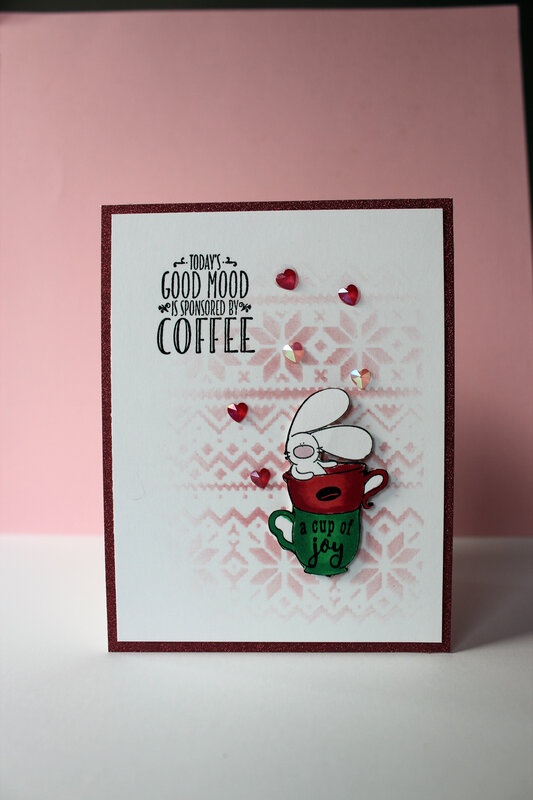 It is special because it is made with a stamp set that I won in the last Coffee Lovers Bloghop. It is from The Cat’s Pajamas and is adorable. The image is small but I wanted it to take centre stage. A soft and faded out stencil background is a good way to ensure that the image isn’t lost. I love the sentiment on this card and certainly for me, is true. I am a Mom to three great sons, a grandmother to seven great grandkids and a totally addicted scrapbooker, cardmaker now that I have retired from paid work. Posted on December 3, 2018, in Card Samples, Challenge Entries, Debbie's Challenge Entries, Oscar's (Deb's) Card Samples and tagged Hero Arts, The Cat's Pajamas, Tim Holtz. Bookmark the permalink. 10 Comments. So cute and the sentiment is so fun. Cute card. I love the bunny in the stacked cups and the stenciled background. Yay! I love seeing when people use their winnings! This is so cute! I love how you managed to make that image the star of the show. So cute with that fun stencil work. Oh what a sweet adorable card. Great background to the sweet cups. Wow, i need to get the stencil and the stamp set, your card is absolutely glorious! Oh, this is so adorable! I love your adorable bunny!